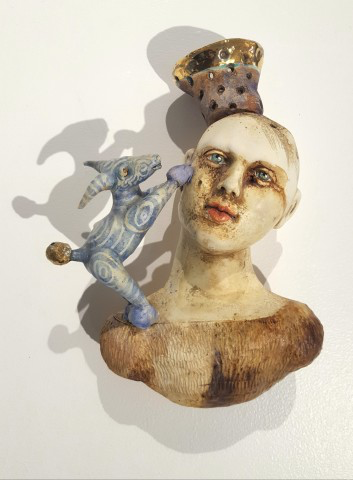 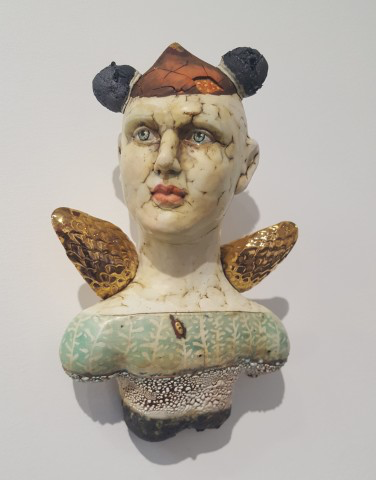 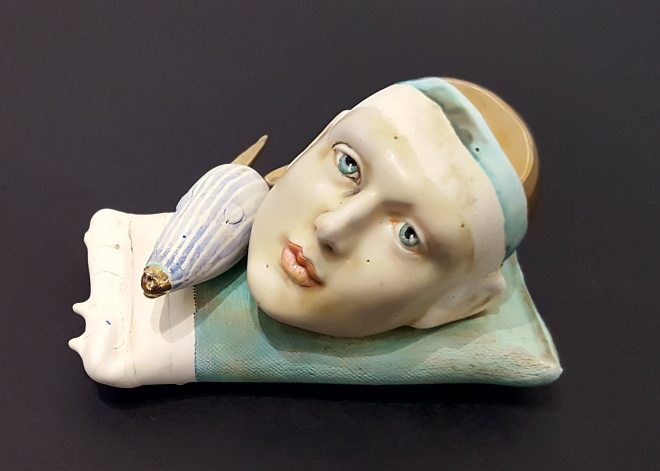 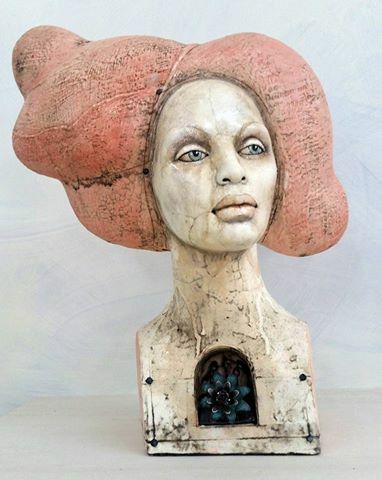 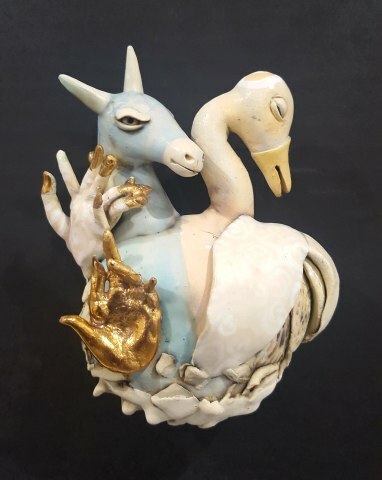 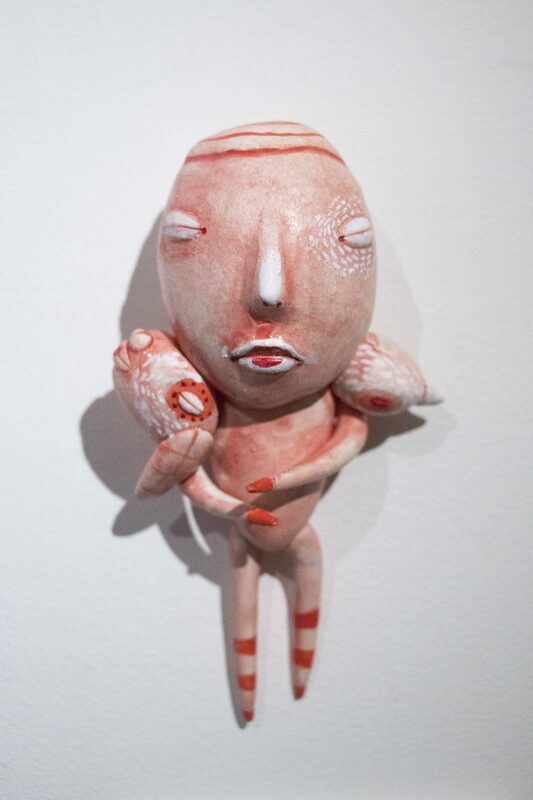 Lisa Clague Unconscious Thoughts, 2017 Ceramic, 12" x 10" x 5"
Lisa Clague Folded Messages, 2017 Ceramic and mixed media, 13" x 10" x 6"
Lisa Clague Pegasus with Swan, Clay, Glaze, Luster, Encaustic, 5" x 3.75" x 2"
Lisa Clague Trinity, 2018 Clay, Glaze, Luster, Encaustic, 6.5" x 3.5" x 2"
Lisa Clague Creature Comfort, Clay, Glaze, Luster, Encaustic, 5.75" x 3.5" x 3.5"
Lisa Clague Blue Dog, Clay, Glaze, Luster, Encaustic, 8" x 6" x 3.75"
Lisa Clague Archangel, Clay, Luster, Glaze, Encaustic, 8" x 5" x 3.5"
Lisa Clague Fire-Water, Clay, Glaze, Luster, Encaustic, 9.25" x 4.75" x 3.25"
Lisa Clague Blind Folded Tea, 2016 Ceramic and mixed media, 8.5" x 6" x 4"
Lisa Clague flower and willow, 2017 Ceramic, 12" x 22" x 12"
Lisa Clague Creature Comfort, 2018 Ceramic, 5" x 3" x 2"
Lisa Clague Tickled Pink, 2018 Ceramic, 5" x 3" x 2"
The distinctive figurative sculpture by Lisa Clague hovers between fantasy and reality –- playful, mysterious, contemplative. 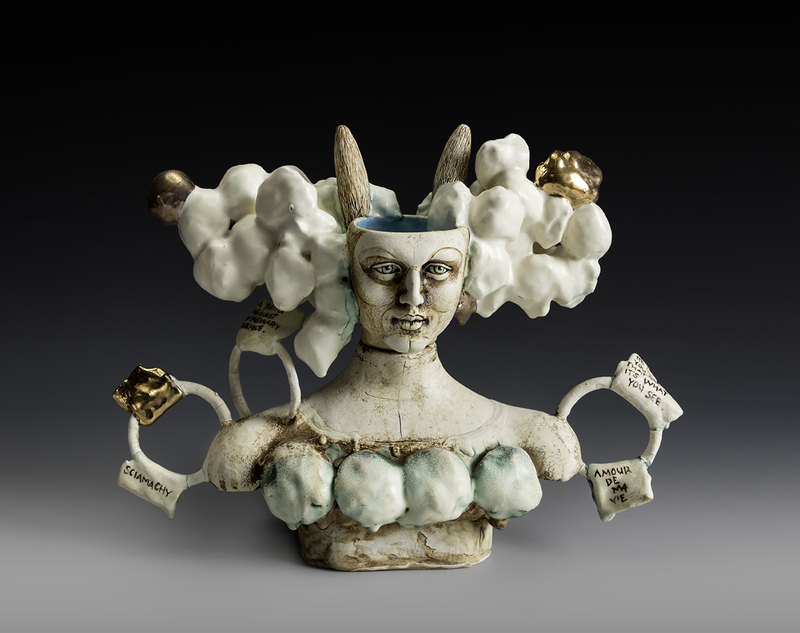 “My work evokes a place between the subconscious and the intangible,” she notes. 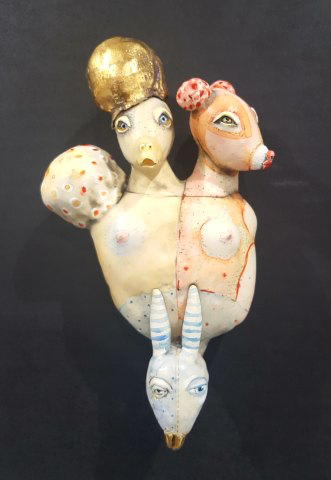 “My masked figures are hybrid creatures, mistresses of ambiguity and disguise, of seduction and deception. 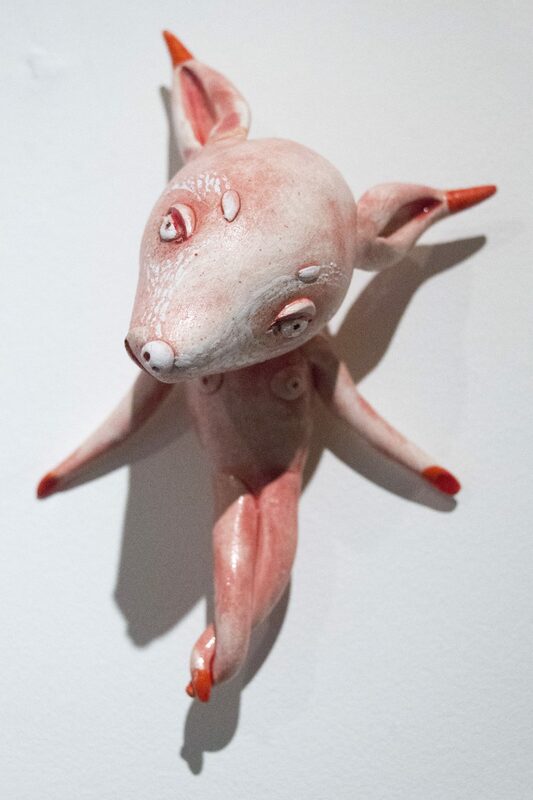 These images, like dreams, are familiar but illusive. 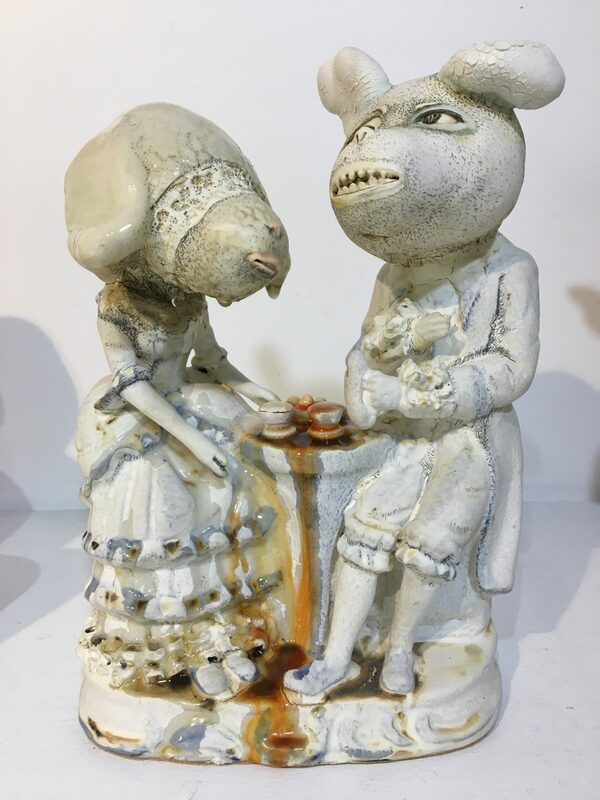 The figures are rendered in white-ware and then treated with stains, oxides and wax. 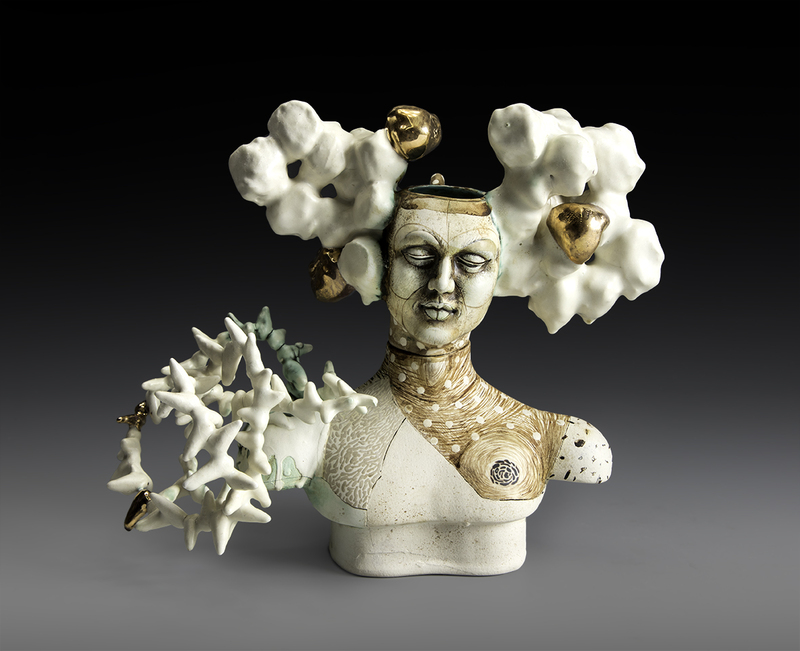 Metal, glass and/or wood are added components to complete the sculpture. 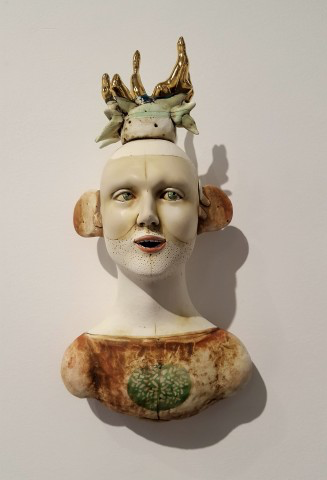 Clague received her Bachelor of Fine Arts degree from the Cleveland Institute of Art and her Master of Fine Art degree from California College of Arts and Crafts.